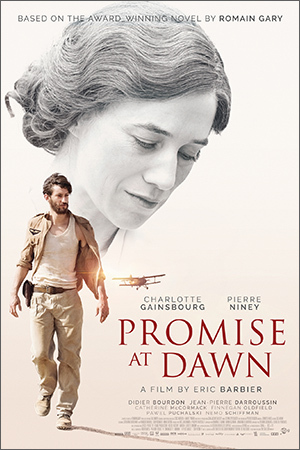 Charlotte Gainsbourg turns in an exuberant performance as Nina, Romain Gary’s overbearing single mom, and César-winner Pierre Niney plays the illustrious author in this filial love story adapted from Gary’s eponymous autobiographical novel. Hounding the boy at every turn—from his childhood in Poland, to his adolescence in the South of France, to his WWII adventures as a bombardier—Nina continually brags to everyone she meets that her son will become a great writer, a war hero, a French ambassador, and a Knight of the Legion of Honor. She thrusts her monumental aspirations onto her young son…and the beleaguered boy is determined to realize them for her.